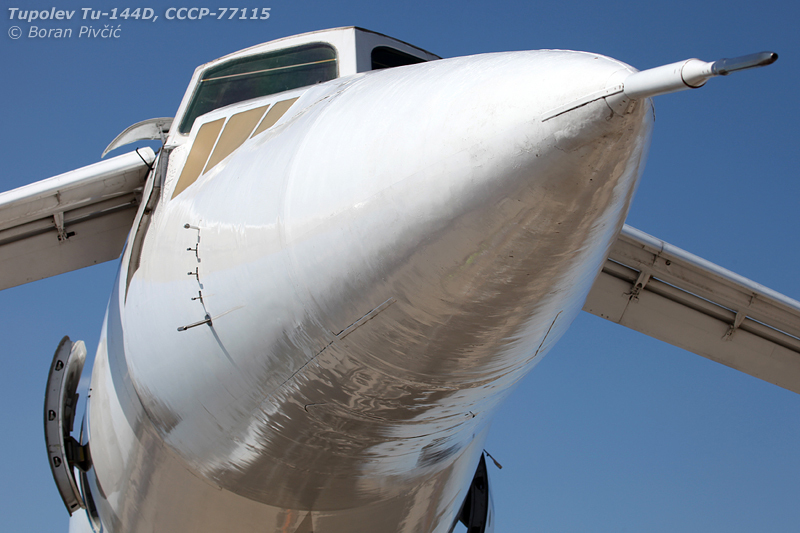 Rare Aircraft – Tupolev Tu-144D, CCCP-77115 | Achtung, Skyhawk! Had anybody ever observed me leaving for any European airshow, he/she would have probably noticed that every time I’d cast a glance over my shoulder in the direction of Moscow, with an expression that begs to be captioned “Soon” :D. For a full decade, ever since it had first started, the Mezhdunarodnyj aviacionno-kosmicheskij salon – MAKS – held near Moscow had, for me, been the Holy Grail of airshows on the European mainland. Each time I’d wanted to go, but each time I’d been held back by either university obligations or economic reality, leaving me with little choice but to attend some of the more predictable airshows in the West (not that I’m complaining). 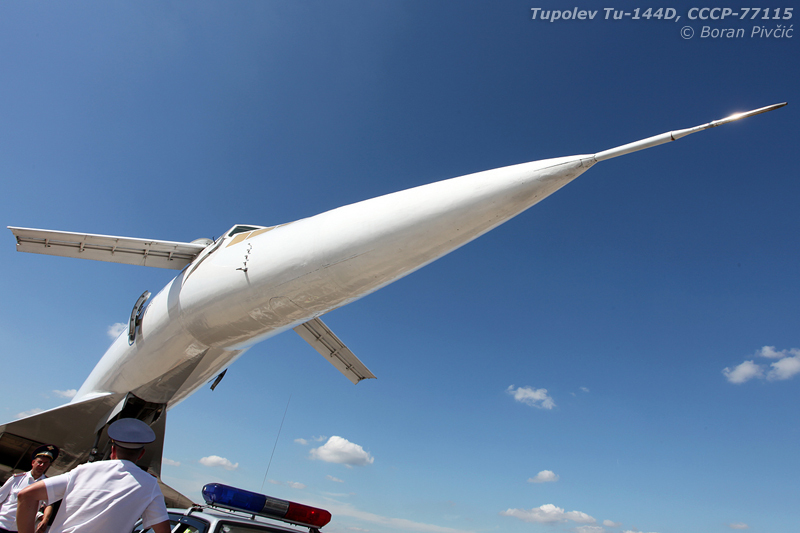 Still a sensation even in its old age, the Tu-144 was always a curious aircraft. Often nicknamed “Concordeski” due to its high degree of similarity to the Concorde (the jury’s still out on how big a part had industrial espionage played in its design), it made global headlines on 31 December 1968 when it became the first supersonic airliner type to fly – beating the Concorde to the punch by a tad over two months. It made headlines again, for completely the wrong reasons, at Paris in 1973, when its highly-publicized (and still partially unexplained) crash started its long decline into obscurity and infamy. Relegated in its last years to plying mail routes around the USSR, by any objective measure the Tu-144 could today be judged a commercial failure – a hare that had sprinted for first place, but had quickly been overtaken by the more refined Anglo-French tortoise. And yet, despite this, the Tu-144 has – dare I say it? – even more charisma and character than the already opulent Concorde. Like the Concorde, it was a brilliant, but flawed design, a design that combined cutting-edge, out-of-the-box thinking with inept government bureaucracy and under-the-table political scheming. And like the Concorde, one cannot help but think of it as a person, a pioneer held back against its will, and not just as a machine doing a job :). 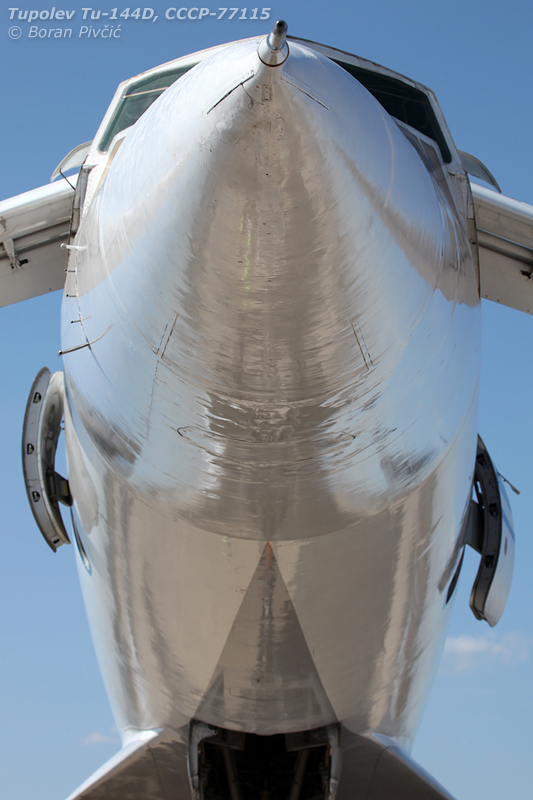 The main reasons of the -144s “flawedness” lie – as they often do – under the wings. The aircraft’s eternal Achilles’ Heel, the -144’s engines have always lagged behind the times in terms of performance, and are arguably the single biggest contributor to the type’s demise. The soap opera to-be first started with the prototype’s Kuznetsov NK-144 reheated turbofans, grouped together under the rear fuselage. A design specifically intended for the Tu-144 – hence the designation – the NK-144 on the face of it seemed to be a winner; while the Yanks, Nigels and Frogs were wasting their time with turbojets, the Tu-144 would be whisked along by futuristic turbofans of the type seen on today’s fast military jets. However, while this sounded fine in theory, behind the scenes the engine had some serious issues. Despite its futuristic layout, the core of the engine was of a dated and unsophisticated design, which had, all on its own, nullified the advantages of the front fan. A far bigger problem was that the engine could not sustain supersonic speeds without the use of reheat, unlike the more refined Rolls-Royce Olympus turbojets used by the Concorde. The end result was an incredibly noisy engine, whose ambition was matched only by its fuel consumption. At Concorde speeds, the NK-144 drank up to three times the fuel of the Olympus, reducing the Tu-144’s range – always a premium on supersonic aircraft – to unsustainable levels of just 2,900 km; an astounding 4,300 km short of its Western counterpart. The only way was up, so Kuznetsov engineers set to work on an upgraded model called the NK-144A, to be used on the production-standard Tu-144S. Slightly more powerful than the Olympus, the new engine went some way to increasing the aircraft’s range, which was now pegged at 3,600 km with a reduced payload – still woefully behind the Concorde. With a full cabin the news were even more demoralizing, with the total range boost amounting to just – 200 km. With a radical rethink deemed the only solution before the -144’s fuel bills ate up half the Union’s budget, the NK-144 was ditched in favor of the Kolesov RD-36-51, creating the second-series Tu-144D (D for dalniyy, or “long range”) – a series that had also included CCCP-77115. A turbojet this time, the RD-36-51 was a modification of the engine used on several Soviet supersonic bomber prototypes, including the stillborn Su-100. And while the RD-36-51 was a quantum leap over the old NK-144, problems nevertheless remained. Supersonic flight was still not available without continuous use of reheat, though the range hit was slightly lower this time – with a reduced payload the aircraft could manage up to 6,200 km, dropping to about 5,300 when full. Still in the Concorde’s wake, but in another league compared to the NK-144 :). Plans to address this even further – though by removing the symptoms rather than curing the disease – were made in the late 80s, whereby the RD-36-51’s 15% higher thrust than the NK-144 would be used to haul more fuel in the tanks, increasing the range up to a theoretical 7,500 km. Christened the Tu-144DA, this project had – like the Tu-144 itself – nosedived into the dirt during the collapse of the USSR. The -144’s final engine change was the most impressive though – but it had come a decade too late to save the old jet. Faced with the need for a large platform on which to test solutions for future trans- and supersonic airliners (a nod to the Sonic Cruiser there), NASA and Boeing had in 1996 teamed with Tupolev to bring one mothballed Tu-144 back into airworthy state (the type having been withdrawn from use more than eight years prior). As part of its refit, the chosen aircraft – RA-77114, the last -144 completed – had been re-engined with the Kuznetsov NK-321 turbofan carried by the Tu-160 supersonic bomber. Producing 25% more thrust than the Tu-144D – and a fantastic 45% more than the original Tu-144S – the Tu-144LL (letuschaya laboratoriya, or “flying laboratory”) had managed to achieve and maintain an incredible Mach 2.35; that’s faster than the F-22, on par with the F-14 and Su-27 and lot much less than the F-15, one of the fastest jets in the sky :). Having flown 26 test flights in total, RA-77114 made its final landing – and marked the final flight of the Tu-144 – on 14 April 1999. Like CCCP-77115, today it is resident of Zhukovsky Air Base (the venue for MAKS) but is languishing in a poor state at a remote apron… out of reach of my camera 😦 (but not out of reach of this one: Airliners.net link). Out back, the angular double-delta wing comes from the same family tree as the Concorde’s more elegant ogival delta – but is simpler, cheaper and easier to produce and maintain. 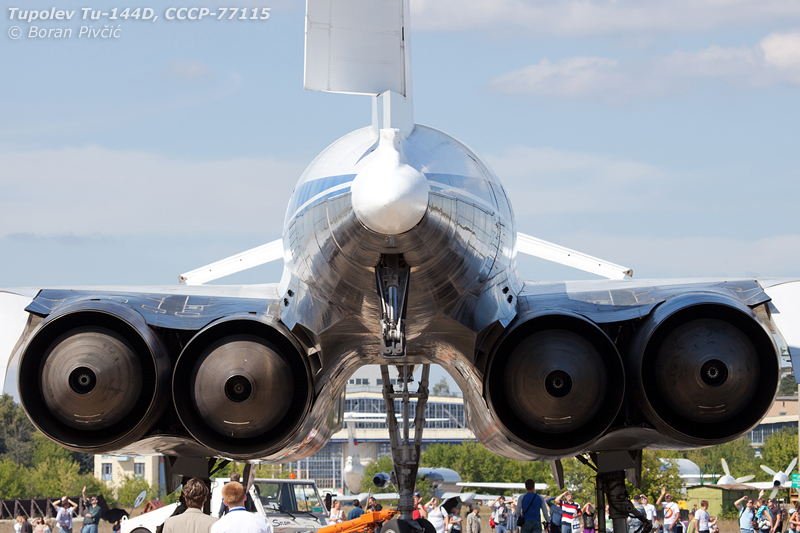 However, at the front, to compensate for the wing’s inferior performance at lower speeds, the Tu-144 has an elaborate set of retractable canards whose aerodynamic sophistication exceeds any similar systems in the West. This trend had continued in a similar vein inside the fuselage. The passenger cabin was the typical, simple and unsophisticated affair found on many Soviet airliners of the time – but with one key difference: unlike virtually all other passenger aircraft of the Union, the Tu-144 had featured a two-class layout, with a five-abreast economy section in the rear of the cabin, and a four-abreast business section up front. Due to the “sardine can” conditions out back, the Tu-144 could also squeeze in more passengers, 140 vs. a maximum 120 for the Concorde. At the pointy end though, the Tu-144 was – by some accounts – on par with the Concorde, though many of the aircraft’s cockpit systems remain obscure even to this day. Apart from the unorthodox instrument layout, traditional aquamarine panel (proven to relieve stress) – and the irreplaceable cooling fans 😀 – the cockpit was very much of the period, sporting a three-man crew and the latest in (indigenous) automatic flight control systems and various navigation devices. The performance – fuel consumption aside – was surprising as well. 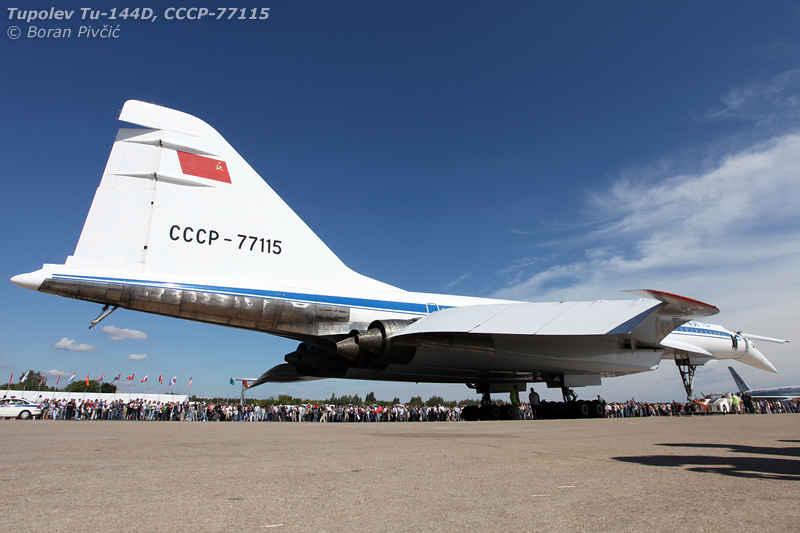 Despite the crude engines and simple wing, the Tu-144 had a 65,000 ft ceiling, about 5,000 higher than the Concorde. Maximum speeds were unexpected too, with the original S model capable of Mach 2.3 and the D of 2.17 or thereabouts – both significantly faster than the M2.02 that the Concorde could do at full chat. This turn of speed was achieved despite inefficient engine intakes that were far inferior to the electronically-controlled ones designed, from the ground up, for the Concorde. The intakes themselves had also given rise to another unique feature – the aircraft’s distinctive landing gear. 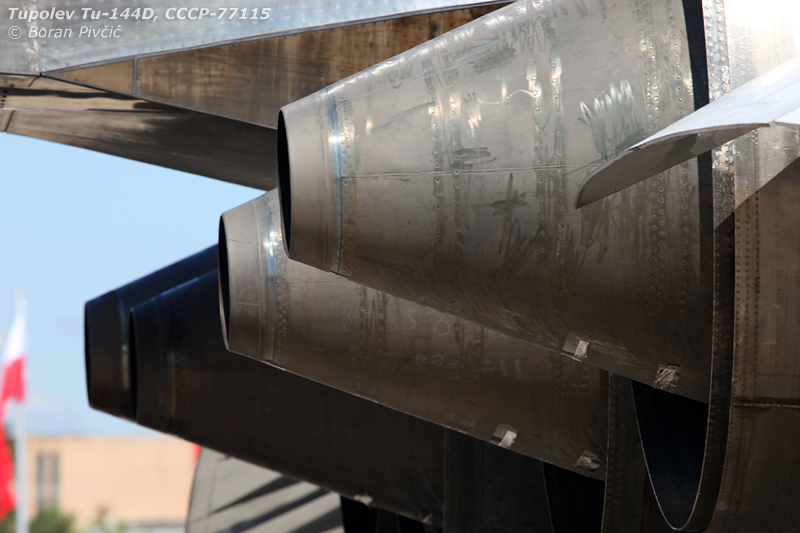 In order to compensate for the lack of digital intake controls (which were required to slow the air down to subsonic speeds before it reached the compressor), the designers at Tupolev lengthened the intakes (which, roughly, achieved the same effect). However, the length required meant that there was space for them only under the fuselage and – as seen on production models – at the very root of the wing. This left no room for traditional landing gear, with its few, but large, wheels. The solution involved a complex system of eight smaller wheels on each leg that would, as the gear retracted, rotate through 90 degrees to the side and slot themselves vertically into recesses between the two engines. Unsurprisingly, this wheel arrangement had also allowed the weight of the aircraft to be distributed over a larger area, thus reducing the load on the surface; which, combined with the large-diameter gear legs, made the Tu-144 fully rough-field-capable – as was actually demonstrated by one example during flight tests :). 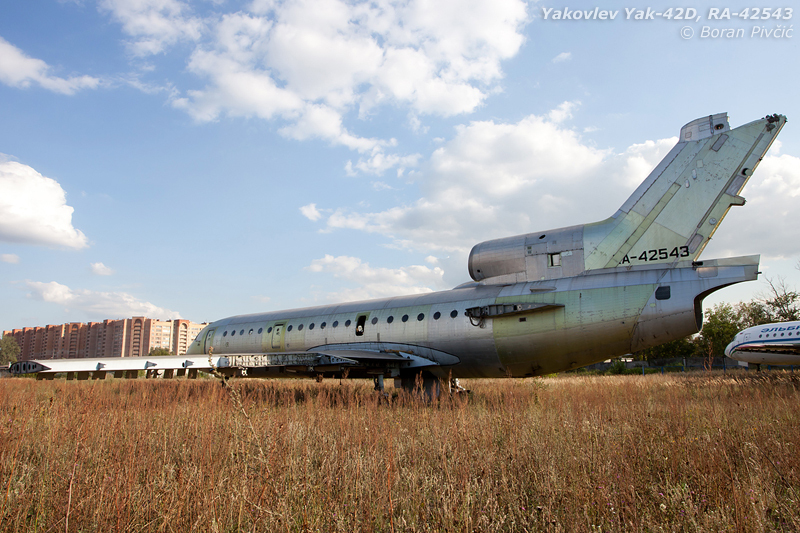 Even more saddening (though understandable) is that by the time its commercial service had ended in the late 80s, the Tu-144 fleet – at that point made up of D models built at the beginning of the decade – had clocked up what could only be described as a pitiful amount of flight hours. 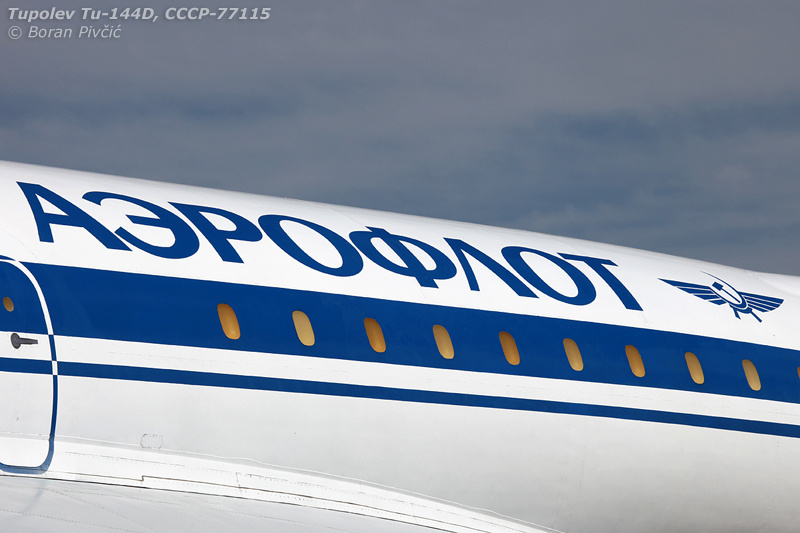 Indeed, I was quite surprised when I found out that “our” CCCP-77115 (the penultimate aircraft completed) was retired with just 38 hours and 34 minutes on the clock! Interestingly, none of that time was logged in Aeroflot service, despite the full Aeroflot paint scheme the aircraft had worn throughout its lifetime. With the wind-down of supersonic commercial services in the USSR all but complete, this aircraft – pretty much fresh from the factory – had been sidetracked into the expanding Buran orbiter program. 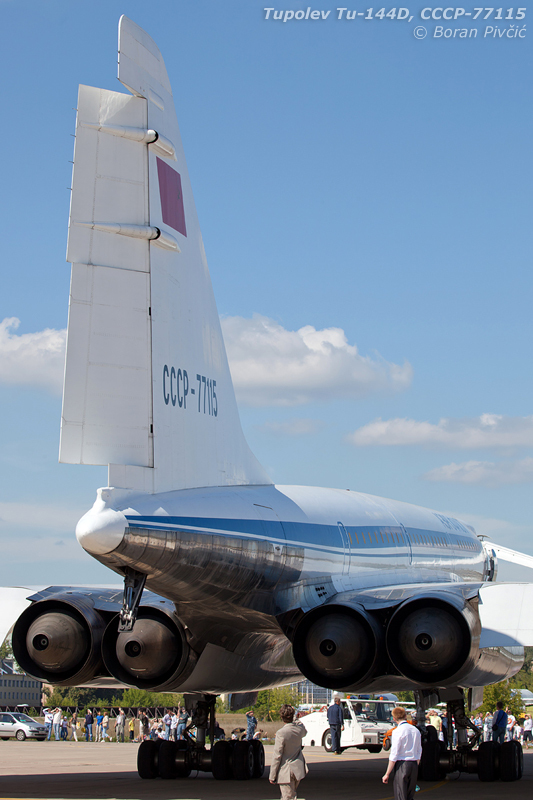 The closest an aircraft could be to an actual orbiter, CCCP-77115 had been used to train the program’s future pilots, until both were dragged under overnight by the dissolution of the Union. Really great pictures and write-up! 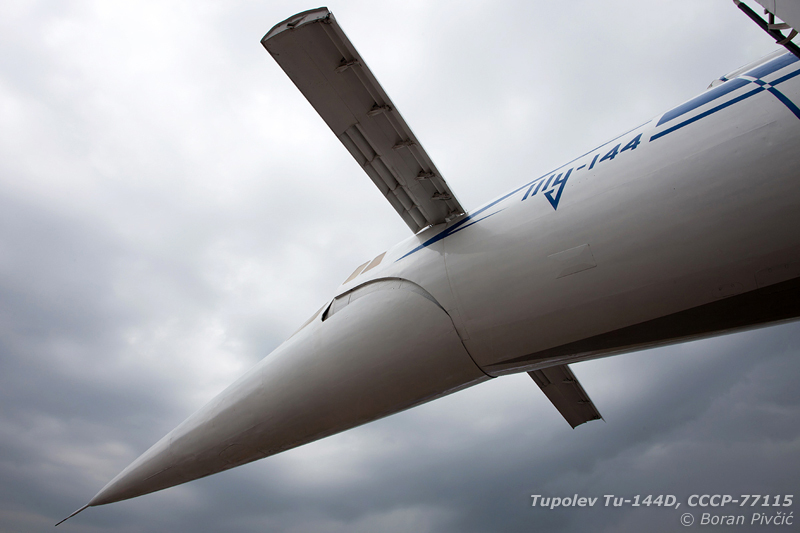 You were so lucky to get to see the Tu-144 up close!